Hello fellow crafters! I'm way overdue for a post--I have several projects to show case--I just have to make the time to create the post. So let's start with this recent project that I created for Authentique where I used one of their newest collections 'Grateful'. This collection is full of rich earth tone colors that represent Autumn as it's best & also the Thanksgiving holiday. 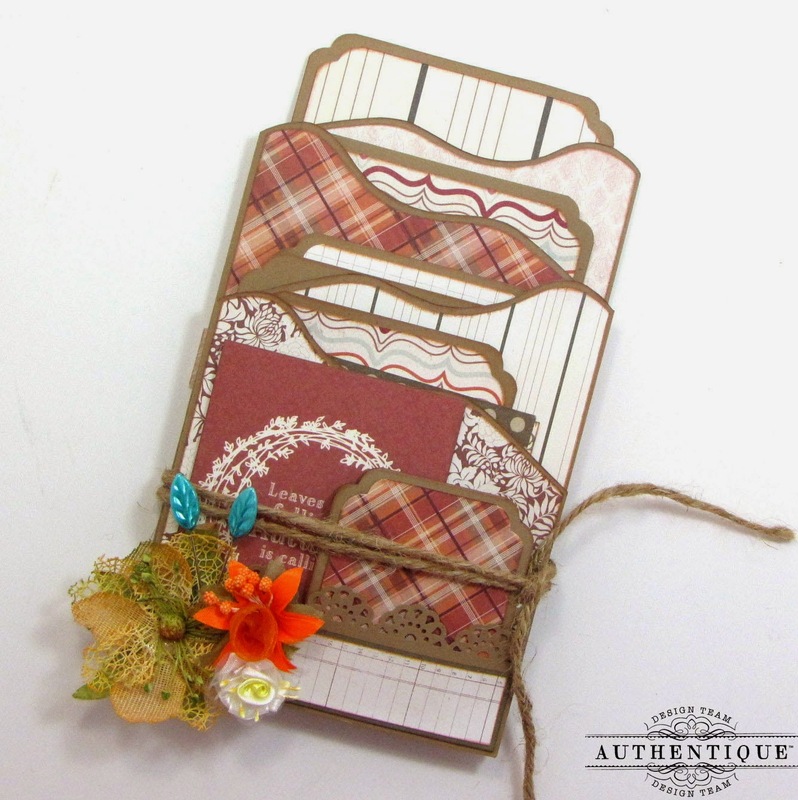 For this mini album I steered away from the Thanksgiving concept & made it more towards an Autumn themed mini. This style of mini album is called a Zig Zag mini album. I found a wonderful tutorial for this mini by My Creative Spirit on YouTube. You can find her tutorial here. I followed her tutorial fairly closely & the main difference was on how I created the top edge of the mini since I used a mini border by Kiwi Lane to give it a 'wavy' border. The bright orange organza star flower & the smaller white & yellow ribbon flower are items from my own stash. You can find these & several more in different colors for sale in my Etsy shop The Kreative Korner. A piece of burlap string keeps this mini closed. Here once can better appreciate the 'wavy' border of this mini. 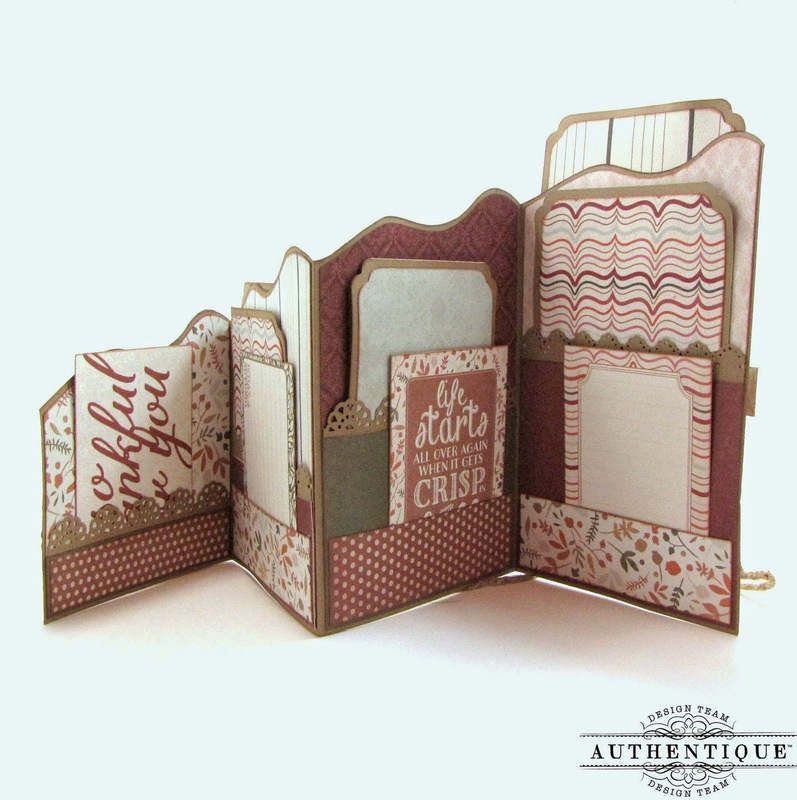 I used the Mini Madison Ave template by Kiwi Lane Designs to create this border. 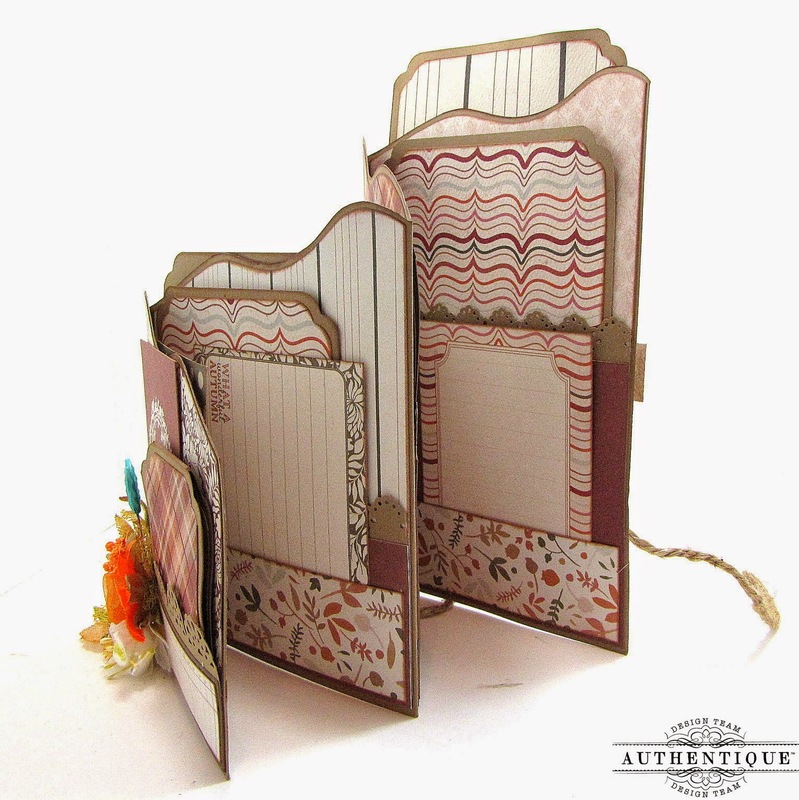 This mini has double pockets on both sides which I've filled with photo & journaling inserts in different sizes. This mini can hold 2" x 2", 3" x 4" & cropped 4" x 6" inch photos. The number of photos it can store depends on how the journaling cards are used. They can be used as both journaling and/or photo mats. Here's the back of the mini. I created a belly band where you can slip a large photo mat. As a stopper for the photo mat, I'm using a sticker from the elements page that come with the 'Grateful' collection. It's only adhered at the bottom so the photo mat can tuck itself right inside. This mini album is available for sale at my new Etsy shop The Kraft Nook. If interested, feel free to visit my shop here. To go along with this mini I created a brief video to show all the different journaling cards, photo mats & pockets this mini album has. Thanks for stopping by & enjoy! Hi kay...this album is just amazing...all lovely details...how amazingly its done! !